Eat Smart: The Zen Anti-Diet was written by Aaron Hoopes, who is a martial artist, yoga and Tai Chi instructor with a degree in Asian history and Japanese culture. This program involves techniques and instructions in the context of the Zen philosophy that are focused on mindful awareness and an intelligent approach to eating. Update: In 2010 Aaron Hoopes has released a new updated version of his program simply called The Zen Anti-Diet. Hoopes has based his program on the idea of the anti-diet because of the evidence that diets do not work as a long term solution to weight loss. He says that instead of looking outside ourselves for answers, we need to learn to turn our attention inwards and carefully listen to the messages from our bodies. Hoopes introduces readers to the principle of smart eating and claims that eating smart is not a diet but about learning to pay attention to your body and the way that food affects your body and mind. When you increase the awareness of the connection between your body and mind this will automatically allow you to pay attention to what you are eating. By learning to replace unhealthy habits with smart eating and a positive attitude you will then start to create a healthy lifestyle that will allow you to reach your ideal weight. Hoopes provides many practical tips and exercises that will facilitate this process. He advises dieters to enjoy eating and savor food slowly so that the body has time to send the message when it has had enough. He also recommends avoiding eating while driving or watching TV and to always eat in a peaceful environment. Chewing for a long time is recommended because it increases our ability to absorb the nutrients from foods. Small frequent meals are preferred because this is much easier on our digestive system and helps to reduce appetite, stabilize blood sugar levels and boost metabolism. Hoopes also explains the negative effects of processed foods, food additives and artificial sweeteners while highlighting the benefits of organic food. Hoopes does not provide lists of recommended foods but does encourage dieters to eat fresh fruit and vegetables, to drink more water and to avoid processed foods and food additives. Fruit and grains are recommended as the best choice for breakfast to refuel the body’s carbohydrate stores and provide energy after the overnight fast. The importance of exercise is noted for its ability to increase metabolism. However no specific guidelines are given for structured exercise and the author encourages dieters to think of exercise as ‘movement’ because many people are anxious about the idea of exercise. Update: In the new version of the Zen Anti-Diet, the author devotes a whole chapter to warm up exercises that are based on primarily Yoga movements. Eat Smart: The Zen Anti-Diet is available as an eBook for $4.95. 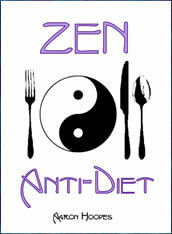 The new version is simply entitled Zen Anti-Diet and is still only $4.95. Highlights the negative effects of fast food and artificial sweeteners. Promotes a gradual approach to weight loss. Includes practical exercises to increase awareness of eating habits. Encourages exercise and deep breathing. Beneficial for dieters who feel their eating habits are affected by psychological factors or habitual patterns. Will not appeal to dieters who prefer to follow a structured meal plan. Does not provide any instruction on creating healthy meals. Does not give clear guidelines for exercise. Many dieters will require a more precise plan in order to see results. Dieters who prefer a more structured program and a meal plan will be disappointed with this program because it does not provided detailed guidelines regarding diet and exercise. This program will probably appeal to dieters who are fed up with trying different diets without achieving long-term success. It will most benefit dieters who feel that there are strong psychological factors influencing their ability to lose weight. Update: The new version of the Zen Anti-Diet is more structured in regards to exercise and the use of Yoga. Hoopes goes into greater details concerning foods and weight loss, however, there still isn’t a detailed meal plan or calorie guide, but this is the whole point of his book as he believes traditional methods of dieting don’t provide lasting, life changing results. Evans, S., Tsao, J. C., Sternlieb, B., & Zeltzer, L. K. (2009). Using the biopsychosocial model to understand the health benefits of yoga. Journal of Complementary and Integrative Medicine, 6(1).